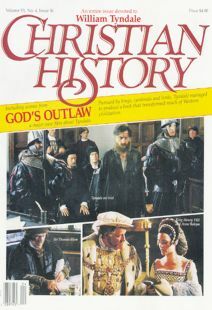 The Independent Works of William Tyndale (Washington, D.C.: Catholic University of America Press, scheduled for release between 1992 and 1998). Yale University Press is publishing newly annotated editions of the works of Sir thomas More, including his polemic writings against Tyndale, and CUAP’s series will feature Tyndale’s rebuttals, as well as several of his expositions of Scripture. Lewis Lupton, Tyndale, Translator and Tyndale, Martyr, from which several of the illustrations in this issue were taken. Published by The Olive Tree Press, Chiswick, England, these books are part of a multi-volume history that Lupton, a retired artist, is writing about the English Bible. No mechanical printing appears in these remarkable books, as Lupton has completely hand-lettered and -illustrated them himself. Brian H. Edwards, God’s Outlaw (Phillipsburg, NJ: Evangelical Press, 1976; reprint, 1986). Henry Walter, ed., The Works of William Tyndale, Parker Society Series (Cambridge: The University Press, 1848–50; reprint London: Johnson Reprint Corp., 1968). George Duffield, ed., The Works of William Tyndale, The Courtenay Library of Reformation Classics (Berkshire: The Sutton Courtenay Press, 1964). J.F. Mozley, William Tyndale (Westport, CO: Greenwood Press, 1971 reprint). Donald Dean Smeeton, Lollard Themes in the reformation Theology of William Tyndale (Published by the Sixteenth-Century Study Council, 1987).